Switches (aka turnouts or points) are an important part of operations on most model railroads. Some modelers prefer to operate their switches remotely by installing powered switch machines. These are great for switches you can't reach, controlling multiple switches at once or just faster operations. But switch machines can get expensive. And even with some alternative installations, there are places that they may not fit. And some modelers just prefer the slower pace of having to stop the train to reach over and throw the switch—just like the prototype. So with that in mind, there is nothing wrong with having hand-thrown turnouts, or a combination of both. If you do want manual turnouts, there are several commercial options available in many scales. To keep switches lined, it is best to have some sort of switch stand to hold the points in position. For switches that don't come with such a throw from the manufacturer, there are several options from other companies that will work very well. Some of these are purely functional, others have contacts to power switch frogs or other devices, and some are detailed to resemble prototype switch stands. This article will cover the basic installation of a common and simple ground throw made by Caboose Industries. These particular No. 202S throws can be used on HO and N scale switches from many manufacturers. and Caboose makes many other options for these and other scales as well. These ground throws cost about $3.00 per switch and ​installs in just a few minutes. Like other machines and motors, there are a few simple tips that will help you make these work their best every time. The ground throws will work best if they are level with the track. 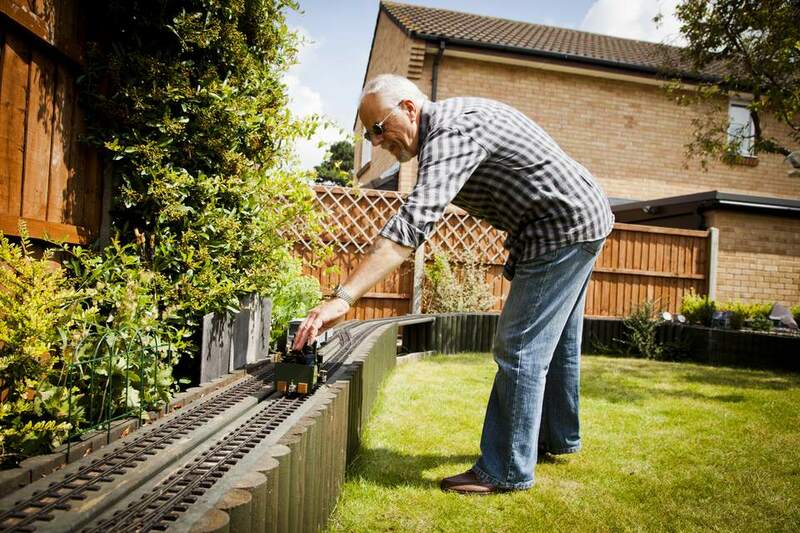 If you have your track on a raised roadbed, cut a small piece to splice onto the side. 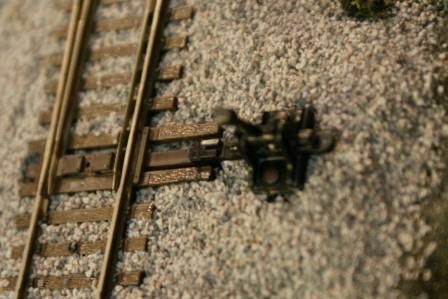 In some instances, you may want to move the ground throw further from the switch, such as when two tracks are close together. With a little extra work, you can often find a way to extend the reach or remotely locate your ground throws. You'll want to trim away the beveled edge on the side of the track roadbed to allow a tighter fit. To make ballasting easier, bevel the sides of the new piece. Fasten the roadbed to your platform with a little glue or a few track spikes. The ground throw has a small peg on one end which is supposed to fit into a hole on the end of the throw bar of the switch. On some switches, like the one seen here, this hole may need to be drilled out to accommodate the peg. The peg itself also needs to be trimmed slightly with a pair of flush-cutting pliers. Cut the peg even with the base of the stand to prevent it from binding on the roadbed as the switch throws. For this switch, the ground throw has a thinner base than the ties, so it needs to be shimmed slightly. Cut a piece of styrene or cardstock the size of the base and slide it underneath. Most importantly, when installing the switch, do so with both the points and the ground throw in the centered position. The two-point rails should be centered, with an even gap on both sides, and the handle of the ground throw pointing up in the air. This way when the ground throw is positioned, it will have an even swing to both sides. Some throws have a spring which will compensate for minor differences, but this step still guarantees the best results. This will also locate the device far enough away from the tracks to prevent clearance issues. To complete installation, simply tack the ground throw in place with a pair of track spikes. Use a pair of needle-nose pliers or a nail set with a hammer to prevent damaging the throw. You can now ballast the switch to finish the look. Just take great care while spreading and gluing the ballast around the points, throw bar and moving parts of the ground throw. Throwing the switch periodically while the glue sets will help prevent it from locking up. You now have a reliable lock for your manual switch that will prevent an accidental throw under your train without breaking the bank.